There are a few blog posts that seem to stick in the mind more than others, and certainly ones that I direct colleagues back to on a regular basis. One of these for me (and I suspect for many others) is the post from Cliff Reid back in July 2012 looking at Life, Limb and Sight saving procedures. Maybe it was because it was around at the start of my entry into social media learning, but also because it still lists those procedures that every emergency physician should know, but in the knowledge that the same topics are on the list of ‘things that scare the **** out of most EPs’. Having been around for a while and having worked in a big city I’ve seen or done pretty much everything on Cliff’s list, everything that is apart from emergency hysterotomy. Now, I’m actually quite glad about that because whilst all the other procedures have the potential to kill the patient, this one has the opportunity for a 200% mortality (although to be honest that’s your starting point and your mission is to reduce 200% to 100% and hopefully to 0%). So, I’m riding my luck. I’m about half way through my EM career and I’ve been lucky so far. No hysterotomies for me, but I’m getting worried. This blog post outlines my anxieties and what I’m doing to help myself. If you find it helpful too then all the better. Basically, the more senior I get the more likely it will be that I will be the person required to make the decision. That day may be tomorrow, it may be never but I want to be prepared and I’d like you to be prepared. It’s therefore time to turn to the #FOAM gods and ask for help. So this post is not about my experience (I have none), it’s a little bit about the practicalities, but mostly it’s about how we can prepare for what I hope will be a never event. There is a lot of stuff already out there on some great blogs (see notes at the end of this post), please visit them and use the experience of those writers, but by sharing my thoughts here I hope to give some guidance on the process of preparing for something that may never happen. This post is also unusual in that I am very happy to amend, improve and adjust if you have suggestions. Please put them in the comments section and I’ll incorporate where needed. This is #FOAM in evolution, not #FOAM edict. Step 1. Ask for help. Thoughts on emergency hysterotomy for CA in pregnancy. 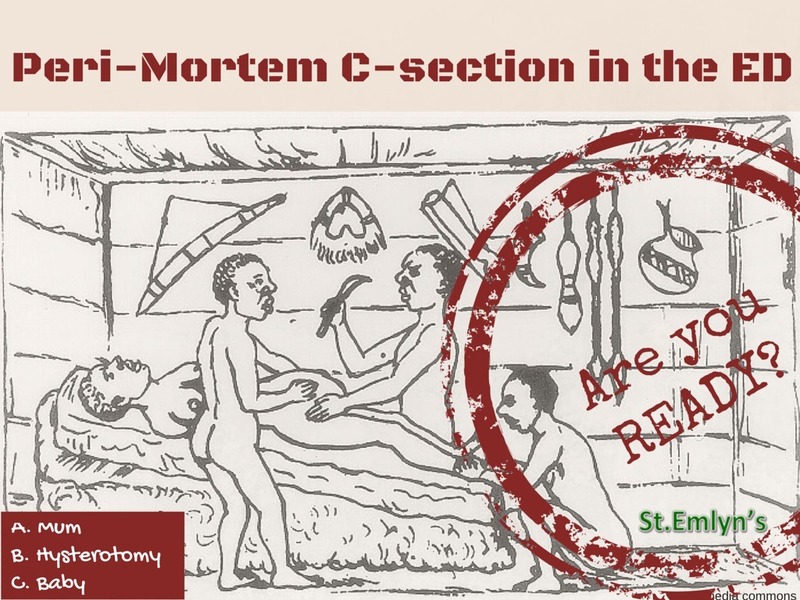 @cliffreid @mikegreenway our service has undertaken one peri mortem C section and have SOP if this was of interest. This is the most important step and luckily is one that you can do right now, this instant and every time you think about emergent procedures in the ED. Cliff describes this metacompetence as the most important step and he is right! Hysterotomy is a time sensitive procedure. If you have a clearly pregnant lady in front of you in cardiac arrest you need to think fast, or perhaps you should not be doing your thinking now. You do not have time to…. This is not a problem though as you can decide when you are going to do it right here and right now. Here it is. If you have an obviously pregnant lady with a easily palpable uterus and they are within 10-15 mins of cardiac arrest onset then you are going to do a Hysterotomy. Some books will say that this needs to be completed within 4 minutes, but hat tip to Casey Parker in Broome for spotting this paper via Cliff that suggests you should consider doing it for a longer time period. If in doubt about times – crack on. So that’s it then, Just go for it? Not quite. The following are CONCURRENT activities. Allocate someone to continue to lead the adult cardiac arrest team. Allocate a team (it’s going to be you) to perform the Hysterotomy. So there are three groups of people here that are going to have to work towards a common goal but with quite specific roles. Yep, this looks like a major human factors management problem so early, clear direction by the team leader is absolutely essential. So, in preparation. What would you say to people, who would you allocate at midday on a Wednesday in your department. Who would you allocate at 0400 on a Wednesday in your department? Think now – there will be no time on the day. I’m thinking in-hospital resuscitation here in my ED. If you are a prehospital clinician you may need to think differently. My pre-hospital experience is in the military and in motor racing, if I get this scenario there I know that I’m having a very bad day indeed! I’d love to hear the thoughts of prehospital friends though. For the C-section it’s probably unrealistic to have specific kit on the shelf for a once in a lifetime event. However, in our department the Thoracotomy tray has retractors, scissors and clamps which together with a scalpel is all that you will need. For the Child – standard neonatal resuscitation kit, again you should have this in your ED already for the unexpected delivery which we all occasionally face. For you – face mask, apron, gown if time, double gloves. Just as though this were a thoractomy for trauma. Standard stuff, nothing fancy. Sterility less important than speed. So in other words, you should know what you need now. You should visualise where it is and how it’s going to come to the bedside in resus. Think about it now. Shout out to Scott Weingart and his excellent podcast on ED Thoracotomy. Slow is Smooth, Smooth is fast. Once you have your gloves on. Slow down and be safe. What feels slow for you is probably fine. Do it right first time without removing anyone’s fingers. Hysterotomy just means opening the Uterus, but for us there is abut more than that. We need to get to it first and then we need to deliver the baby, then the placenta. How are you going toget to the Uterus? You have to get through the abdominal wall and then through the Uterus itself to the amniotic cavity where you will find the baby. It seems to me that there are two options for this. The typical C-section incision through the abdominal wall is a Pfannensteil transverse lower abdominal incision through the skin, followed by dividing the rectus sheath vertically and entering the peritoneum vertically. It is great for cosmetic appearances and is also known as a bikini line incision. A midline vertical incision from pubis to umbilicus. Straight up, through the linea alba (midline between the recti), clip to peritoneum, open peritoneum, use scissors to extend up and down from umbilicus to pubis. Now, I have not done Obstetrics since I was a med student, I did do a lot of surgery so I’m used to putting knife to flesh, but I am also quite simple. I am going to go for option 2, and I think you should too. It’s pretty easy to remember and I like that. If you are familiar with Obstetric techniques and you are confident with the Pfannensteil – go for it. Roger Bloomer and his chums in Australia did it successfully so I am in no position to say don’t, but it’s too clever for me. Once you are in the abdomen you will see the Uterus there should not be any structures between it and the abdominal wall. The bladder may still be present at the lower end of the incision. Try to avoid it, but do not waste time catheterising the patient. Again, because I’m going to do a vertical incision in the abdominal wall I’m going to do the same in the Uterus. Starting at the bottom of the incision use a scalpel to open the uterus. Once opened use a pair pf scissors to extend the hysterotomy towards the pubis. Make a big hole, it’s going to make stage 3 easier. If the placenta is in the way, you will just have to cut through it. There should be a lot of fluid about at this point. If you did not put an apron on you may be regretting that decision at this point. Right, you need to get the baby out. Step 4: The cord and placenta. There is much discussion about when to cut the cord following a normal delivery. This is not a normal delivery. Cut the cord and hand to the clinician waiting to resuscitate the baby. Scoop the placenta out with your hand whilst applying traction on the remaining cord. You may have to close the Uterus, but in my department I’m hoping that help will have arrived by this point. No, of course not, but maybe yes as well. Er….,so what can we practice? 1. We can look to simulate the scenario, the human factors and the roles that we would need as we resuscitate our patients. Jason Wagner has put together a simulation for hysterotomy and kindly shared the video via Twitter. Here is the construction video link for @washuem Simulated Crash C-Section on Vimeo http://t.co/bgSIkRnN . Soon out for publication. http://vimeo.com/32749876 This is fantastic stuff, but it’s not the same as the real thing. C-sections are a messy business and whilst your patient is arrested there may not be much blood flow, there will still be plenty of blood and amniotic fluid knocking about. The Sim lab will not familiarise you with the feel of the tissues, the smell or surgery and the anatomical features that you would expect to find as you perform the procedure 2. So, phone your local Obstetrician and ask them to join them for an elective section list. Whilst this will clearly be different, they may well use a Pfannensteil incision for example and that’s fine. You will still get to see what the uterus looks like, how thick it is, how big a hole do you need to deliver the baby, how to get the baby out etc. Please, consider a half day in the Obstetric theatres. Familiarity breeds contempt of fear. Go on, give them a call today and make a date. 3. Use the greatest simulator known to mankind – the Human Brain. Learn more about the wonders of the intra-cranial simulation suite right here. I have no doubt that this will be a stressful and unpleasant experience. Since you were starting from a point of two dead people, it is extremely unlikely that both Mother and Child will survive. For you and your staff this will be something that you will remember for a long time and you will no doubt reflect on it over the next days weeks and months. As a team leader you really should take time to debrief the team and yourself. Keep an eye on your colleagues and make sure they stay safe. There is already a lot of stuff out there in the world of #FOAM. Casey Parker on Can you cut it in Obstetric Resus? Roger Bloomer’s case report on prehospital hysterotomy –Prehospital resuscitative hysterotomy. CEM FOAMed network rapid guide from the inspiring @SPayneSarah & @DrJHurley which encompasses same principles. Previous: Previous post: Teamwork in Resus: Just Like Football? Next: Next post: Emergency Medicine, a risky business Part 5. Does a correct diagnosis mean that the therapy will work? The most powerful thing I learnt when I was doing my own research into PM C-section was that it was a procedure aimed largely at improving survival outcome for mother. I’d always assumed it was a ‘Mum’s dead but we might be able to save the child’. Getting that uterus empty, improving venous return and efficacy of CPR…it just seemed to bring the importance of the skill as an EP more forward in my mind! Cheers Cliff, it’s worth saying that our Obstetricians are really keen for us to come. No harm in seeing their world as well. We don’t need them often but when we do it’s often fairly risky stuff. Always good to have met in good circumstances before we really need them. Simon- great article and thoroughly agree particularly with the comments about ‘Intra-cranial simulation’. Regular visualisation of these rarely performed, life-saving procedures is an extremely valuable tool. I was ‘lucky’- as a gas-man I have spent (more than) my fair share of time in obstetric theatres observing probably 200+ caesareans from the top-end, asking questions and trying to absorb information (hence the pfannenstiel). I can’t say I’d had the same opportunities prior to my first surgical cricothyroidotomy or thoracotomy, but I had thought them through and rehearsed in my own mind (thanks in part to Cliff’s training in Sydney) what I would need to do and probably more importantly what I needed the other members of the team to do. Also one I hope to continue avoiding…… when at my previous trust we lost all obstetrics, our update teaching advocated delivering the feet first (as they were easier to grab) – any real supporting evidence either way? The 4am scenario bothers me – how many departments honestly have enough senior staff around out of hours to have two people competent in/willing to attempt C-section and neonatal resus? (At least in Virchester you could steal the reg from Virchester Children’s ED). Hi KC good to hear from you. The head was advocated as it may be stuck in pelvis and need a jiggle to get it moving! However in reality I might well do as you suggest. You are quite right about the 4am problem which is why I put it in. As a consultant I worry less about how to manage EM when I’m there, much much more worried when I’m at home. The only current solution is great training and trainees. At Virchester we could mobilise three registrars and two juniors immediately, and then 2 consultants in 20 mins. Not ideal but much better than most places. I performed my first perimortem caeser last year. I was a third year registrar (resident) in OBGYN. It was in our labour ward that it took place. It was a patient who had an abruptio, during a labour ward round we found her unresponsive. Long and short of it we started CPR,the epidural crew happened to be around so they came to assist whilst we performed the caeser. Mother alive, baby demised. Massive abruptio. I work in a 20 bed labour ward, 7 high care beds, first stage,admissions and two 24hr obstetric theatres. I agree with Greg Press, PMCS is a resuscitative intervention for the mother. Thanks for sharing Lusanda. There are few amongst us who have had to make this decision. Glad to hear that the mother survived but sorry about the baby. I agree with yourself and Greg about this being a resuscitative procedure for both mother and baby.